In United States, the Friday following Thanksgiving is known as Black Friday and is often regarded as the Christmas shopping season. This year, the Black Friday 2014 will fall on November 28, as it the start of Christmas shopping season, the markets will be overcrowded by the shoppers. If you want to save yourself from stepping into this crowd and fighting for discounts, the best way is by shopping online this year. During Black Friday, many online stores and services come up with amazing deals and discounts. Many even release huge discount coupons which can be redeemed while checking out. Doing this you’ll save some bucks and won’t even have to go all the way to the markets and waste energy and money. In this article I will list some of the best places on the Internet where you can avail Black Friday Deals. BestBuy.com is one of the best and most trusted online shopping portal with thousands of products and deals. This year you can visit BestBuy.com for hottest deals and huge savings. 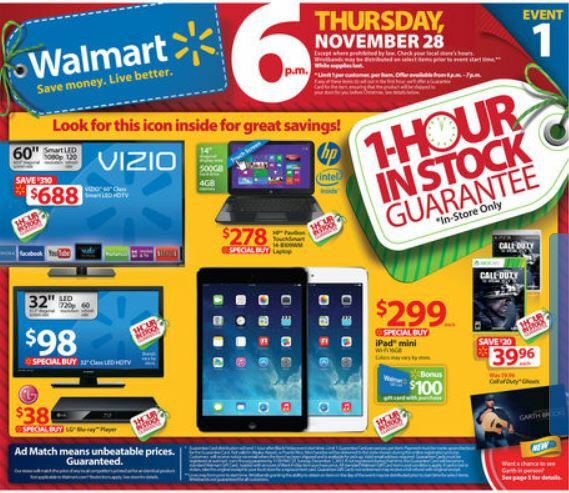 According to BestBuy.com, this years on November 28th you’ll get amazing deals on Laptops, HDTV’s, Blu-ray Players, Electronic appliances, Music players, Gaming consoles, video games, Digital cameras, Mobile phones, Home Theatre systems, iPods / MP3 Players and much more. So whether you are shopping for Christmas presents or Birthday gifts then this Black Friday you can avail best discounts on them. The worlds largest online superstore has a lot to offer during Black Friday. The store is known for amazing deals and large variety of products ranging from electronics, clothing, household, books, video games etc. If you wish to shop online during Black Friday, then Amazon.com is the first place to look for. On Black Friday you can buy products from Amazon at low prices, every year Amazon conducts clearance sales during this period. Another great online shopping website for great Black Friday Deals is Target.com, like every year, Target.com comes up with great deals on almost all products like Baby products, Women clothing and products, Men clothing and products, kids clothing, Electronic gadgets, household items, Toys, beauty products, Entertainment products like movies, music, video games etc. This is an all-in-one place for your shopping and also offers free shipping when you shop for more than $50. Why fight the crowd at the stores and malls when you have eBay right on your computer. Just log on to www.ebay.com during Black Friday season and avail the discounts on shopping. At eBay you can buy anything from pin to piano at reasonable prices, And with amazing Black Friday deals, you can do shopping without burning a hole in the pocket. Get amazing deals on; Electronics, tablets, mobile phones, music players, jewelry, household stuff, toys, cosmetics and other beauty products etc. With eBay you can do shopping at the comfort of your couch, no more waiting in long queues, overcrowded malls and stores. The stores listed above are the best and most trusted by online shoppers. This Black Friday, get the best deals and discounts by logging on to these online stores.